Lugs and terminals provide connection, termination and grounding for electrical distribution systems. Connecting and terminating devices for electrical devices and cables are used to connect conductors together and to other components that makes up an electrical distribution system. Lugs are a type of device which is connected to the ends of wires and cables to facilitate connections to equipment terminals. R.L. Cook has inventory depth in compression or mechanical type in a full range of sizes. We also stock hard-to-find types like blank tongue, belled end, stacking and specialty pin adapters as well. 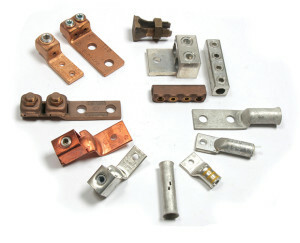 Connectors are made in a wide range of types and sizes depending on the size of conductor, the voltage of the circuit, the specific connection to be made and the method by which the conductor is attached to the connector. We stock a comprehensive inventory of both mechanical and compression styles. Grounding refers to establishing a direct connection between earth ground and an electrical system. We stock a variety of grounding materials, whether you are connecting to pipe, rod, cable tray or an enclosure.